Work on your feet? Here's the first rule: never cheap-out on Socks. That's why when it comes to these Uniform Socks, we go above and beyond to keep 'em stocked. Made in the USA. Never met a march they couldn't keep up with. Brand new, fresh, ready for your most intense mission. 12 pairs give you 2 full weeks of working comfort! Gung-ho comfort. Order your 12 pack now! U.S. Military Surplus Uniform Boot Socks, 12 Pairs, New is rated 4.4 out of 5 by 81. Rated 5 out of 5 by david6952 from FIT I wear a size 8.5 wide boot, socks were a perfect fit. Military size small I think. Has cushion at heel and toe. A bit lighter than the wool mix socks I have. Just what I wanted for Summer wear. Rated 1 out of 5 by hermanjamers from Too much compression so I pitched'em Too much compression so I just threw them away. If you turn them inside out and notice any threads dangling then just leave them alone. If you cut them off then you risk having a hole appear in the sock. I just took a chance with these socks because I was looking for a sock with no compression. Even if I cut off the ribbed elastic section at the top, the body of the sock was too tight on my feet. 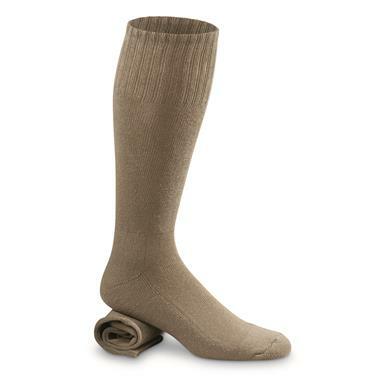 Rated 3 out of 5 by Annoyed from Green gym socks These are green gym socks; maybe not right if you are looking for Army style socks. However, they are made in the U.S.A. and they are new. Be careful if you have longer legs, though; I'm 6 feet tall and they end above a crew sock but below an over-the-calf. Rated 4 out of 5 by GNP88 from Good Socks These socks are well made in the U.S. They fit good . Rated 5 out of 5 by lars from good deal nice fit and feel. Rated 1 out of 5 by Revman50 from GLORIFIED GYM SOCKS I ordered these socks believing that they were padded like the boot socks that I have ordered in the past. These are just tall green gym socks, the extra padding is minimal. I will be returning these. Rated 5 out of 5 by Brad from Great Value Second time I have ordered these socks. What a great value for durable over the calf socks. Nothing but the best for your hard-working feet.